The thing with pop-up shops is that they are often small with very little covered area. That means when it’s wet or overly hot, your customers are forced to either endure the weather extremes or bypass your store. It makes sense then to invest in some shade and weather protection around your pop-up store. 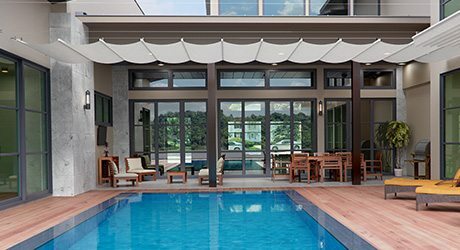 With over 20 years’ experience and expertise in the design, manufacture and installation of awnings, canopies, shade sails, pergolas, screens and blinds, and polycarbonate roofing, we’ve seen most shade and weather protection applications. In recent times, however, a new need has appeared – pop-up shops. The addition of a retractable awning to a pop-up store can increase the size of the store significantly. Not only that, the shade protection it provides will draw customers into your shop. We can even have your awning sign-written with your store name or logo. 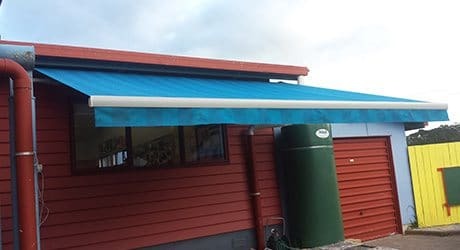 Whatever the size awning or canopy you require, we can custom design, manufacture and install one that will benefit your customers and your business. Our range includes canopies and retractable awnings that are effortlessly folded away when not in use and even motorised retractable awnings for ease of use. 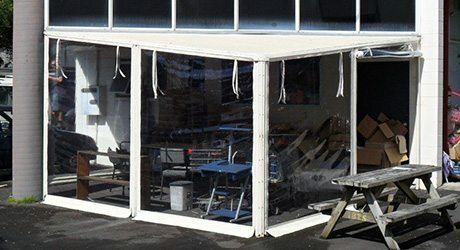 Total Cover Shade and Shelter has a range of screens that can provide great protection to your pop-up shop. We have a range of colours and high quality, weather-resistant clear PVC which allows outside light in and views out, or sunshade mesh to block out the sun and still provide a view looking out but not in. Our drop down curtains and screens are easily rolled up when required. We even have automated screens. We also custom make fixed panels in mesh or clear PVC that act like a fabric window. If your pop-up shop would benefit from a more permanent weather shelter or shade structure, then a polycarbonate roof could be perfect for you. For a strong and robust roof for your pop-up shop or the area surrounding it, you can’t go past a fixed-frame canopy with either PVC or polycarbonate roofing. A Total Cover Shade and Shelter canopy provides additional outdoor space with protection from the rain and harmful UV rays. The Wave Shade is the ideal solution to your existing timber pergola or as a complete structure from Total Cover Shade and Shelter. It looks styly and even a bit romantic while doing the job of protecting you. We use high-grade sunshade mesh and stainless steel fixings. It is manually operated.